I've always just bought a bog standard set of clip-ins, nothing overly special and never spending more than £50. Until now I've just plodded along with these with knowing I should invest in a better set! And better is where these beauties from Dirty Looks come in! Dirty Looks are a fab brand who specialise in clip-in extensions! Their full heads are loved and worn by many and when I got the chance to try them out I was over the moon! Extensions make me feel a whole lot better about myself and like a pair of fake eyelashes, a glam night out is not complete without them! 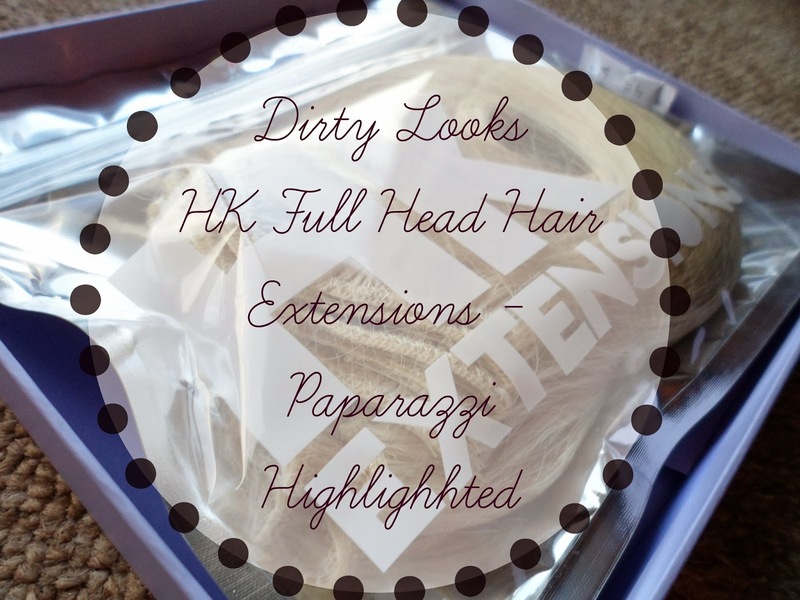 These are the HK Full Head Extensions in the shade Paparazzi Highlights. First up - the packaging is so cute! A lovely purple storage box which is so nice compared to other brands I have tried out, normally it's just some plastic packaging - nothing you can keep, so this was a pleasant surprise and confirmed my thoughts that these were going to be better quality than anything I've used before. The second thing that really stuck out to me was the separate pouch in the internal packaging which contained just a single weft. This is for you to take out to test and check that you like the shade and it matches your colour okay and that the length is good for you. I think this is a genius idea! All extension companies need to do this - such an easy way to test out the shade properly without tampering with the whole set - high five whoever thought of this! As soon as I had tested and seen that the shade was perfect for me I quickly opened up the main pocket and checked out the beauties. These extensions are so much thicker and heavier than any that I have used before, they are 20-22" set which weigh around 180g and are made with gorgeous Remy human hair. 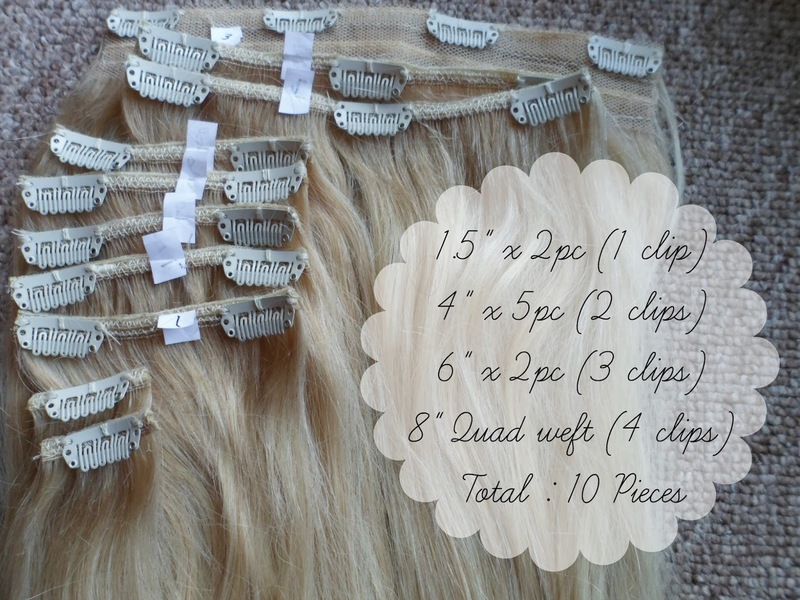 Something I had been really looking forward to trying was the quad weft which is 4 wefts sewn onto a flat mesh which is just fabulous, such great quality and saves alot of unnecessary clips to get the same naturally thick look! The set consists of 10 pieces which I have shown and listed in the photo below. 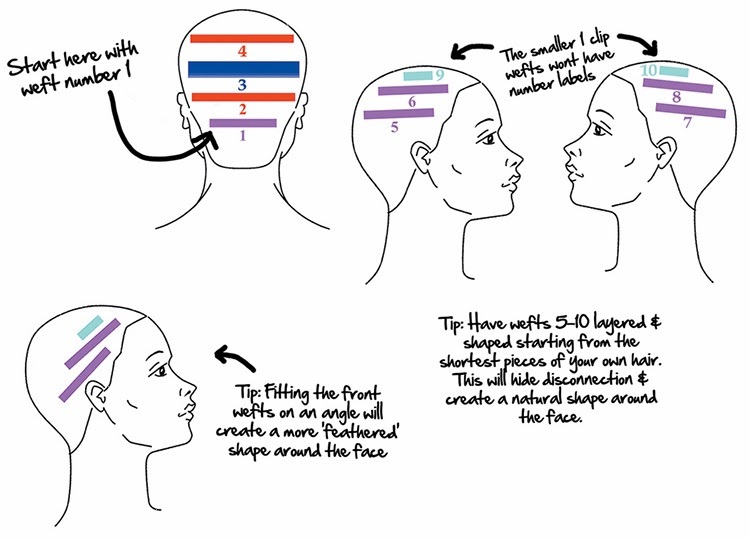 I couldn't wait to get them in and transform my looks and although I am pretty much an expert at putting in extensions after all these years I saw their personal guide and thought - another great idea! 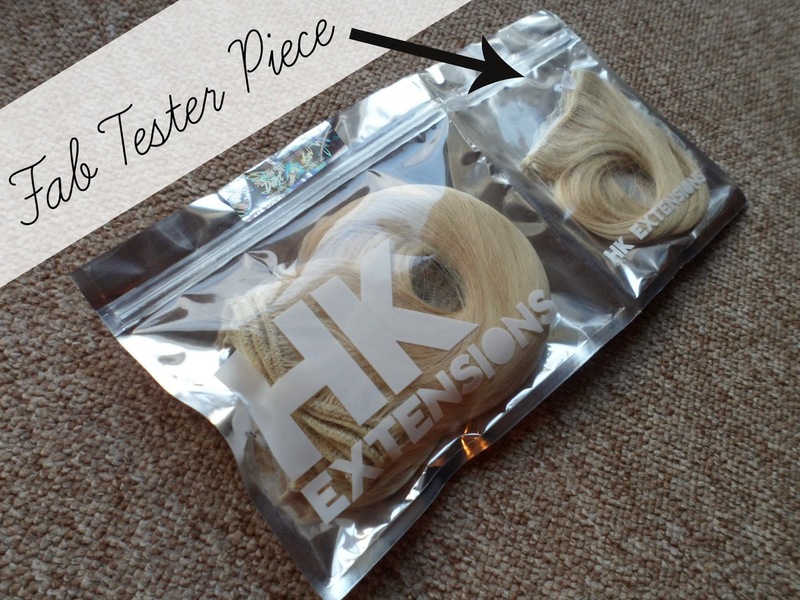 If you are an extensions newbie or just not that great at the whole application bit then this is for you! All the pieces are numbered (the tiny white tags attached) and in the booklet you receive comes a super helpful diagram of which pieces to fit where! Obviously you don't have to follow this down to the strand as everyone is different, just do what's best for you! 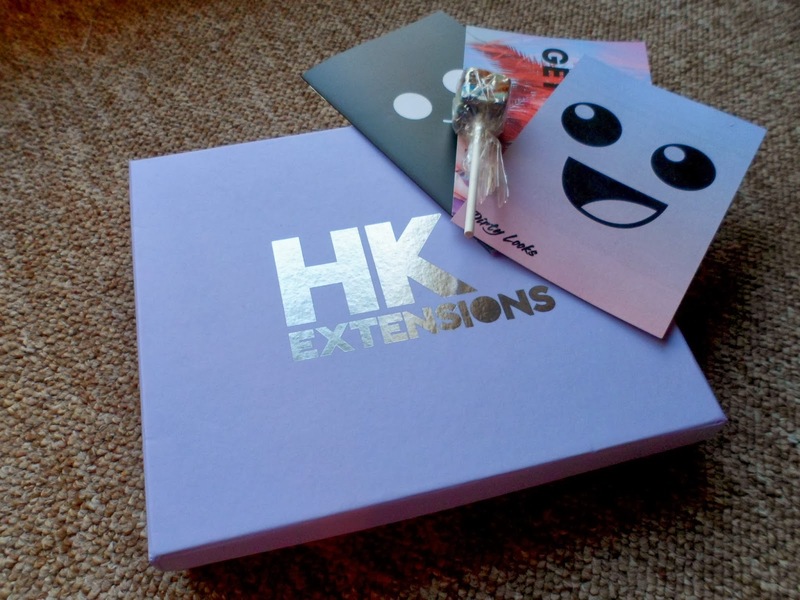 But it is a great, rough guide as to how to fit the extensions well. So easy to apply and a great overall look, I am obsessed. It is so nice to have extensions that stay thick all the way to the ends - previously I've had to deal with hair that seems to thin on the way down! You can really tell that these are of a higher quality not by just the way they look but the way they feel aswell - by far the softest hair I've ever worked with. For the full head set they are only £69.99 at the moment - normally £87.49, there are so many different shades to choose from aswell and if you aren't sure about which one to go for (like I was) then just e-mail a photo of yourself over to the girls and boys at Dirty Looks and I am sure they will happily match you! 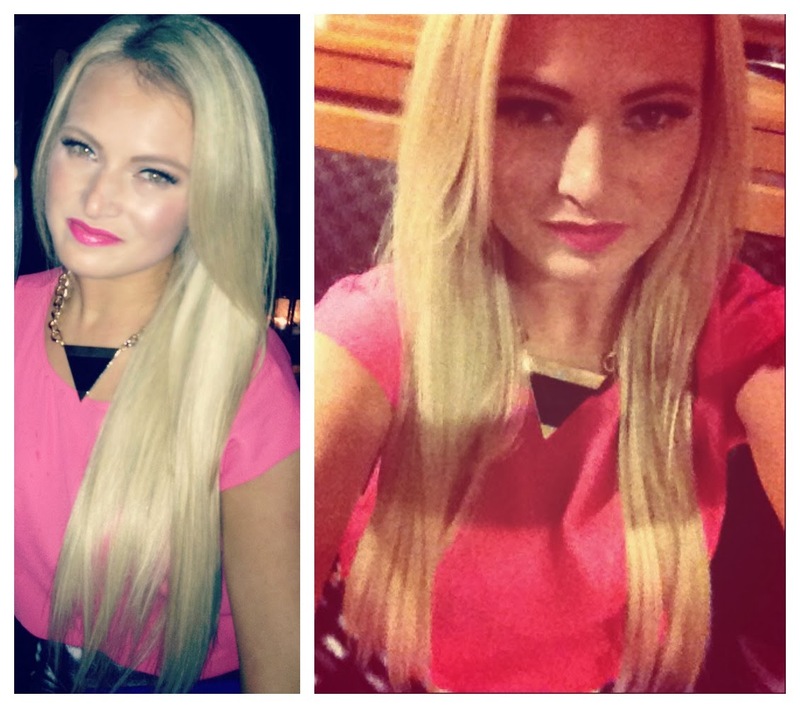 I am SO impressed with these extensions from Dirty Looks and there is noway I could go back to another brand now! I've had so many compliments from friends in both real life and on photos I've uploaded! So far I've only worn these straight but I can't wait to have a go at styling them - curls, waves, up, plaits - I am going to be wearing these alot! These beauties are totally worth every penny in my blonde haired opinion - £69.99 isn't that much more than I was paying before and I think there is probably double the amount of hair than my previous set, I feel silly for ever buying cheap ones! Check upto date with everything Dirty Looks with the links below! Are you an extensions wearer? Have you tried out Dirty Looks? What do you think of these? I've seen so many amazing reviews on these extensions, I'd really love to give them a try but my hair is ombre and I'd hate to ruin them with dye or bleach! These look so think and natural on you and the colour is a perfect match! I've never tried proper extensions before but I''m going through a phase of wanting to try extensions or a wig or something! Thinking about them but I guess for a newbie maybe these are too expensive for a first try! I have been looking for proper set of extensions for ages, but it's hard to pick the right shade. The idea I have come up with to test the shade before you buy them is great. I'll have to check them out Great review!